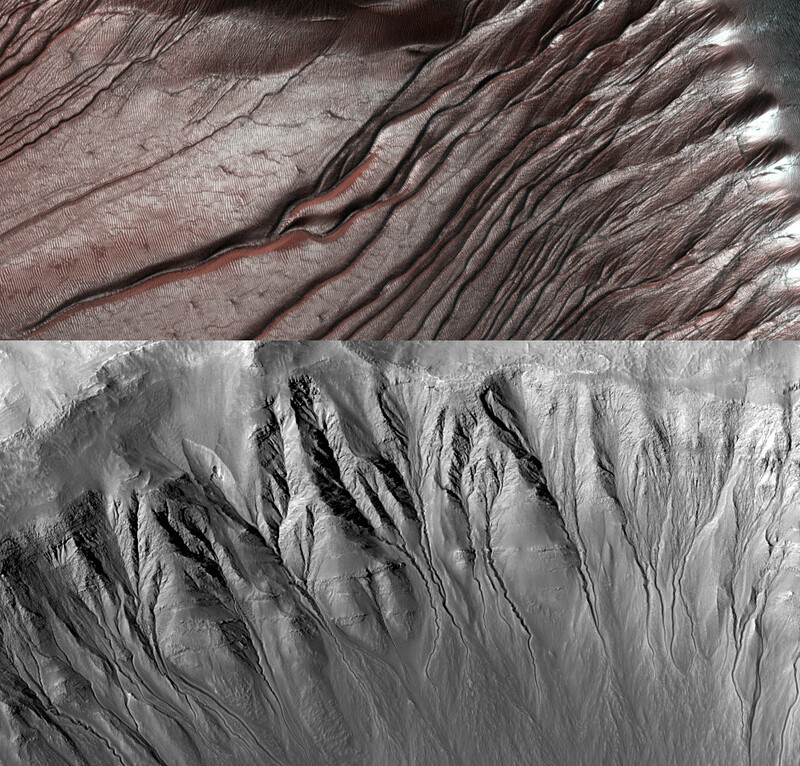 Examples of Martian gullies. Until recently they were thought to have been sculpted by flowing liquid water, but they may result from defrosting dry ice processes at the end of winter. Above, gullies on dunes in Russel Crater (54.3°S, 12.9°E) are partially covered by CO2 ice. Below, sinous gullies in a crater in Newton Basin (41°S, 202°E). Image credits: NASA/JPL/University of Arizona. Since 2000, the cameras in orbit around Mars have transmitted numerous images of small valleys cut into slopes, similar in shape to gullies formed by flowing water on Earth. The gullies seem less than a few million years old — and sometimes less than a few years old. This suggested that significant volumes of liquid water may form on Mars today. 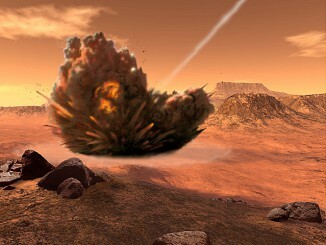 This scenario has recently been questioned by frequent monitoring of the Martian surface by the HiRISE camera aboard NASA Mars Reconnaissance Orbiter. This revealed that gully formation is ongoing on present-day Mars, at seasons when the surface environment of Mars is much too cold for liquid water to flow. However, the observed gully activity seems to occur when CO2 ice (condensed from the atmosphere during winter) is defrosting on the Martian surface. Can the two phenomena be related? If so, how could a thin seasonal dry ice layer deposited above the regolith trigger the formation of decametre-scale debris flows behaving as if they were lubricated by liquid? To better understand the interaction between the CO2 frost and the surface materials, Cédric Pilorget, researcher at the Institut d’Astrophysique Spatiale (CNRS/Université Paris-Sud) and François Forget, CNRS scientist at the Laboratoire de météorologie dynamique (UPMC/ ENS Paris /CNRS/Ecole polytechnique) have developed a numerical model to simulate the environment on a slope. From the underlying regolith to the atmosphere above, the model takes into account the energy exchanges due to radiation, thermal conduction or induced by CO2 phase changes. A key characteristic of the locations where CO2 ice condenses is that there is always a permafrost layer composed of water ice-cemented grains a few centimetres below the surface. Thus, when CO2 condenses on the surface in winter, the air present in the porous near-subsurface is trapped between the impermeable permafrost layer below and the CO2 ice layer above. How debris-flows looking like water-sculpted gullies can be triggered by dry ice processes on Martian slopes. 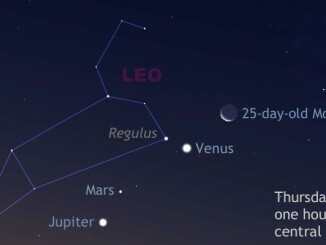 Image credit: Cédric Pilorget, François Forget, et al. In such conditions, the numerical simulations carried out by Cedric Pilorget and François Forget have revealed a surprising behaviour. At the end of winter or in spring, the solar light penetrates into the translucent CO2 ice layer and heats it from below. The CO2 ice does not melt, but “sublimes” (it passes directly to the vapour state). This gas diffuses down through the near surface porous soil. A fraction can recondense there, while the rest of the gas accumulates in the porous volume. This can considerably increase the near-subsurface pressure, up to several times the atmospheric pressure value. The CO2 ice layer eventually ruptures, inducing a violent decompression. Within a few seconds and up to a few minutes, several cubic meters of gas (and possibly several tens of cubic meters around the vents) have then to flow up through the soil. Such fluxes are able to destabilise the soil grains to form granular flows. Moreover, they can also fluidise the avalanche which may behave like a viscous fluid. Although this process has no exact analogue on Earth, it can be related to terrestrial pyroclastic flows, which are gas–particle mixtures generated during volcanic eruptions. Such flows can travel several kilometres even on very moderate slopes. They can transport metre-sized rocks, and have been found to exhibit side “levees” which are very similar in size to the ones observed on the side of Mars’ gullies. As on Earth, where debris flows triggered by rain or melting snow are rare events, it is likely that an uncommon combination of conditions are required to destabilise the slopes. The model created by the two French scientists can also explain why Mars’s gullies are located mostly in the 30°–60° latitude range — with a few spots at higher latitudes — and why most gullies are found on poleward facing slopes between 30° and 45° latitude. The CO2 induced pressurisation and fluidisation is predicted to occur precisely where gullies are observed. All these findings suggest that the solar heating of the seasonal dry ice deposited in winter on Martian slopes is at the origin of a fraction — and possibly all — of the gullies observed on planet Mars. This process has no terrestrial analogues and do not require liquid water. According to this study, the gullies area may not provide potential habitable environments in Mars’ recent past. 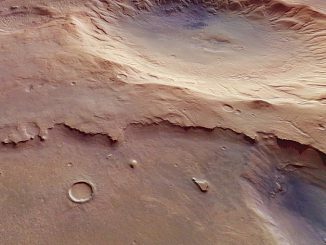 This striking perspective view from ESA’s Mars Express shows an unnamed but eye-catching impact crater on Mars. This region sits south-west of a dark plain named Mare Serpentis (literally ‘the sea of serpents’), which in turn is located in Noachis Terra (literally ‘the land of Noah’).